JACKSON, Andrew (1767-1845) was an American soldier and statesman who served as the seventh President of the United States from 1829 to 1837. Before being elected to the presidency, Jackson gained fame as a general in the United States Army and served in both houses of Congress. As president, Jackson sought to advance the rights of the "common man" against a "corrupt aristocracy" and to preserve the Union. 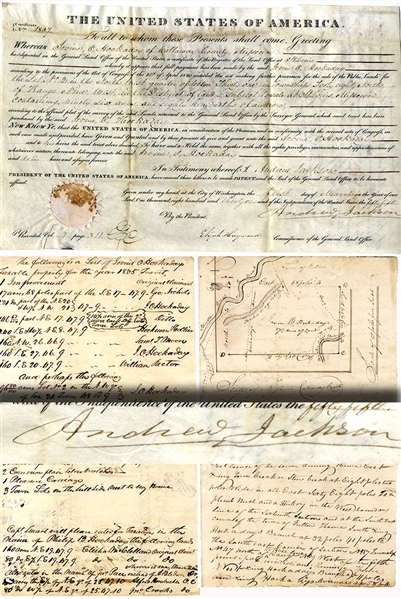 Document Signed “Andrew Jackson” as President of the United States, 1pp. oblong folio, vellum, March 1, 1831, being a land grant issued to Irwin Hockaday, for land in Missiouri. Fine condition...plus; Document Signed being a list of property of Irwin Hockaday, 1835 that lists amongst other things “5 Negroes - 1 a man 38 years old $350, 1 man in his prime $400, 2 women in the prime of life $300, 1 girl 8 or 9 years old 150.” Fine condition.